You are here: Home / Health / Black Moms & The Infant Mortality Crisis. There is, unfortunately, an indisputable truth in America: that black mothers, and their babies, die at a staggering rate during childbirth. When compared to their white counterparts, even across class lines, the difference is shocking. Even during their prenatal appointments, black women are treated unbelievably poorly. Their concerns are ignored and minimized by doctors; medical staff treat them rudely; not to mention the institutionalized, systemic racism that black people in general endure throughout American society, which, for black women, is compounded by a multitude of experiences reflecting sexism. One of the most recent full-fledged investigations into the crisis of American infant mortality rates was the New York Times Magazine cover story, “Why America’s Black Mothers and Babies Are in a Life-Or-Death Crisis,” written by journalist Linda Villarosa (a black mother herself). The feature article, which came out in April of 2018, detailed both the cumulative research which has proven that the crisis exists, and also followed the personal journey of a Simone Landrum, a black mother who suffered the tragic experience of delivering a stillborn baby due to medical complications that were arguably quite preventable. Despite advocating for herself on multiple occasions to her doctor, telling him of her severe symptoms, such as intense swelling, strong headaches, and sensitivity to light, her doctor ignored her pleas for help, instead telling her to calm down and simply take some Tylenol. After Landrum later tracked down her medical file, it also revealed that the same office had measured her blood pressure, which indicated an alarmingly high reading, for which no action was taken. This negligence led to Landrum eventually losing her baby due to complications related to her extremely high blood pressure. The article then follows Landrum’s journey of becoming pregnant again—this time, supported by a doula, who helped her both process her grief and move forward towards delivering a healthy baby boy. Unfortunately, Simone Landrum’s story is only one of many. Countless studies have proven the fact that black mothers are treated substantially worse than white mothers during their pregnancies. 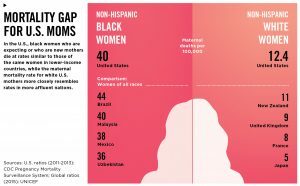 These statistics and findings are striking: it is an undeniable fact that black mothers and their babies face dramatically different obstacles and outcomes. Americans, and our politicians, enjoy touting our international prestige and standing. It is then profoundly shameful that, despite leading the world in many areas, we seem to have all but forgotten the lives, and dignity, of black women and their babies. How can we boast about freedom when black women and their babies are not given equal freedom to receive fair medical treatment? This crisis is widespread and serious, and it’s time for Americans to realize its gravity. Understanding the role of a responsible “doula”; a woman who assists women during labor and after childbirth, is critical. Seek out community organizations which work to support black mothers in your state. The Times Magazine article specifically follows the work of Birthmark Doulas, a New Orleans collective which provides care for women of various backgrounds and classes. Their doula services are available for a fee, on a sliding scale, or even free of cost for low-income women. The Time Magazine story traces the journey of Simone Landrum, and how her doula, Latona Giwa, supported her during her later pregnancy, during childbirth, and even post-partum. The story illuminates how Giwa provided much-needed emotional support, and how she literally advocated for Landrum during her delivery when the medical team treated her poorly. This is to say that organizations like Birthmark Doulas can help support you in a system that is, to say the least, stacked against you. Whether you can afford to pay their fees or not, this can be an invaluable resource for you to receive more personalized and sensitive care. Seek out community organizations in your area, through an internet search, or your own medical practitioner. Make a conscious effort to advocate for yourself during medical appointments. Whether you have a doula or not, it’s always a good idea to be vocal about your needs and concerns during your medical appointments. It’s sad that this is the reality, but the odds are that many doctors could potentially dismiss your concerns and ignore your symptoms, even when you know deep down that they are serious. Again, it’s a grim reality, but in order to protect both your own health and the health of your baby, make a point of standing up for yourself during your medical appointments. If your doctor seems dismissive, repeat your concerns: For example, “I know that you’re not concerned about this symptom, but I truly believe that it’s serious. Could you please run some more tests, or refer me to a specialist for a second opinion?” The doctor may get defensive or angry with you, but know that it’s well within your rights to speak up for yourself when you think that you’re being treated unfairly. If you feel nervous about doing this alone, perhaps bring your partner, a family member, a close friend, or even your doula with you to your appointments so that they can chime in if they notice that you’re being treated unfairly. Again, it’s wrong that you even need to take these extremes measures in the first place, but being your own advocate can help mitigate the discrimination you may face. Practice some relaxation techniques to decrease your stress levels. High stress levels are common not just in black mothers, but in black women in general, most likely due to the societal discrimination that you may face. This extreme amount of stress can have detrimental effects on both your own health and the health of your baby. An excellent article on Essence.com titled “We Need To Rethink What We Tell Black Mothers About Coping With Stress” explains several ways in which you can try to decrease your stress levels. The authors, Aisha Collins and Fatima Varner, note their own research and what they’ve learned. The authors note that, for some women, mindfulness can be effective. This is one of the most common recommendations made by medical practitioners for coping with stress, and does hold some merit. But interestingly, they note that, in their own survey, it was found that for black women, prayer seems to be more effective. They also note that, in terms of methods, trying to “pray with gratitude” seems to be more effective than prayers focused on your own mistakes. So, consider adding either heartfelt mindfulness thinking or serious prayer into your life. If you prefer prayer, try to reflect on what you’re thankful for in your life. It could seriously help your stress levels. My hope as a writer and freelance journalist; the product of a mom who, with the loving support of family, medical attentiveness and prayer, birthed 10 healthy children. My hope is that this article will provide you the reader as well as all expectant moms with some much-needed information on the current infant mortality crisis in America. Remember that you deserve the best medical care possible, and sadly, you may need to be very vocal in order to receive it. My soon to be released book: Our Fault: The Infant Mortality Rate and the Black Community; will delve deeper. Remember, always seek out resources in your local community first, stand up for yourself, and try your best to reduce your stress levels through things like prayer meditation and thanksgiving; be positive minded because there is hope! All the numbers and still irresponsible black women have abortion left and right. And sorry black men condone or persuade them to do it. Abortion is reducing our numbers faster than AIDS, cancer, black on black crime and police brutality all combined. Wake up people. The unborn child deserves the right to lie, not to pay for your mistakes with his life.